Since April 2015 the Medical College Admissions Test (MCAT) has changed considerably. We’ve got the inside scoop on why the test was changed and we have resources you need to prepare for the new sections. Why did the MCAT change? Simply put, the MCAT was changed because it needs to remain current. With the world of medicine so rapidly changing and evolving the test needs be updated in order to continue to accurately reflect the roles of physicians and the changing needs of patients. With improvements in technology, research and treatments, the topics covered in the test needed to be updated. Physicians now more than ever need to possess a high degree of cultural sensitivity, and the MCAT is reflecting that with the addition of new topics. Sociology and Psychology are now essential fields to study in the lead up to the MCAT, reflecting the importance of these subjects for practicing doctors. There are three additional subject areas: 1) university level biochemistry, 2) introductory psychology and 3) introductory sociology. Passages will also place more emphasis on integrating the topics so you can expect to see a variety of topics all within the same passage. The breakdown of the questions is 10 passages with 4 to 6 questions from each,15 standalone questions in each of the science sections, and then 9 passages in the new Critical Analysis and Reasoning section. Go Conqr has plenty of resources on these topics for you to maximize your MCAT score. 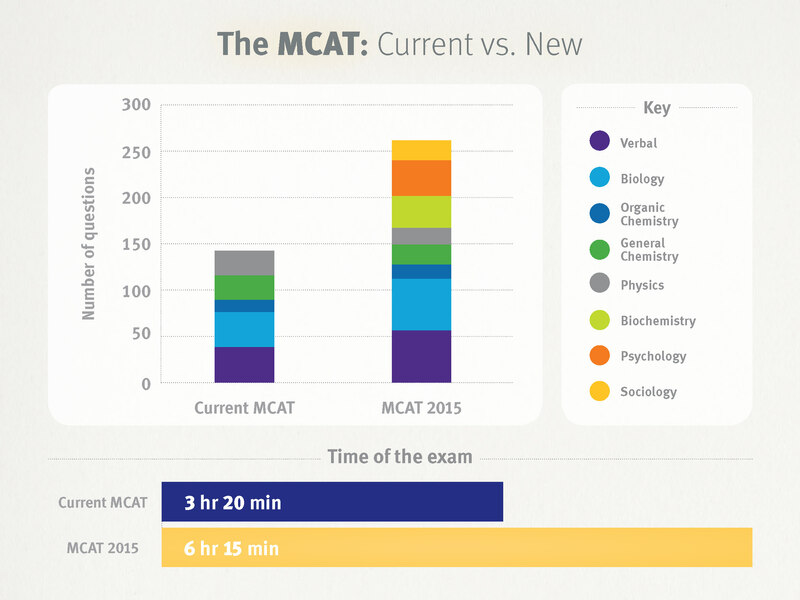 The MCAT has now almost doubled in length, from 3 hours and 20 mins to a solid 6 hours and 15 minutes. You’ll be faced with 230 questions rather than the mere 144 asked in the older tests and the MCAT 2017 will require a lot more stamina and focus. The reasoning behind the increased length is that it will help train and prepare you for lengthy hours spent at the hospital where being able to concentrate intensely for extended periods of time is necessary. Getting into Medical School is tough, and like any good doctor, having the right tools, such as those that GoConqr provides, will help you succeed. Since 2015 each of the four sections are scored from 118 to 132, for a total possible score of 528. The new expected average is 125 per section for a total average score of 500. This is a change from the previous 1 to 15 per section and 1 to 45 total scale. The new MCAT timing, question breakdown and scoring is all designed to make the test more fair. The new MCAT tests two additional skills. The first is Research Design which focuses on the fundamentals of creating research projects, experimental design, bias, faulty results, and variable relationships. The second is Graphical Analysis & Data Interpretation which focuses on deriving conclusions and drawing inferences from visual data, including figures, graphs and data tables. On the new MCAT 2017, passages will be restructured to test all of the natural sciences within biological systems involving physiology and/or pathology. You need to show the application of all the tested sciences to medicine, which will encourage you to view these subjects not simply as prerequisites for med school, but as important to the practice of medicine in general. You can continue to add to and develop the resources that you create in GoConqr while studying for the MCAT when you have continued to Medical School, accumulating knowledge that you will use when you are eventually a practising doctor. The verbal reasoning section has been renamed to ‘Critical Analysis and Reasoning Skills‘, or CARS. Unlike the previous Verbal Reasoning section, the new CARS section no longer includes passages on the natural sciences but instead it focuses exclusively on humanities and social sciences passages. Your preparation in psychology and sociology will be useful here! All in all, the changes to the MCAT 2017 are intended to continually improve the medical field and its physicians, which should be reassuring to patients. Medical School will prepare you to be a good doctor, the MCAT will prepare you for Medical School, and GoConqr can help you prepare for the MCAT! How Much Will the MCAT Cost? Here at GoConqr our goal is to help you achieve your study goals by offering a series of helpful posts like this one along with a ton of other study tools and resources, all for free! To help you study more effectively and efficiently make sure to check out our Mind Maps, Flashcards, Quizzes and other tools that will make studying a fun and easy process (even for the MCAT).